Our office is located in Victoria, British Columbia on beautiful Vancouver Island, just west of Vancouver, and north of Seattle. Vancouver Island is a place of opposites and extremes. Rugged coastline gives way to beautiful sandy beaches, snow-capped mountains to lush, green valleys, and majestic wilderness parks to vibrant cities and quaint communities. This area, all up and down the coastline from Oregon to Alaska, has been home to indigenous peoples for thousands of years; their daily lives shaped by the topography and climate of this land. Drawing on the wealth of these ancient cultures, their traditions, experiences and advancements, indigenous artists of the Northwest coast are creating a flourishing art form which continues to evolve. Each region has its own distinctive styles and artists are pushing the boundaries of expression with new perspectives and interpretations of whatever the subject matter may be. At Cedar Hill Long House Art Publishing, our goal is to bring the art of this rich cultural heritage to you and share our admiration and respect for the First Nations of the American and Canadian Northwest. 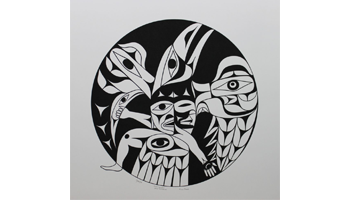 Of course, there are many materials and mediums used in Northwest coast native art, yet our focus is on limited edition serigraphs. Serigraphs are made by hand through a process called ‘silk screen printing’, thus ensuring that we sell original art, not reproduction prints. In this way, we are able to offer you one of the most affordable ways to own original art. We are in a constant dialogue with experienced and new artists from this region. All of them are finding creative ways to share their passion, talent, and inspiration to communicate their stories, traditions and ideas through their art. We think that you will agree. Contemporary Northwest Coast artists are successfully combining the old with the new and creating a modern, refreshing and youthful art form that is steeped in tradition. Take another look – or take one for the first time.